Virtual workstations continue to gain momentum in the industry as a way to deliver high-performance workstation class desktops in a secure and efficient way. For organizations whose employees have been tied to physical workstations or be forced to deal with frustrating file replication solutions, virtual workstations offers a breath of fresh air. Organizations can leverage the power of virtual workstations to centralize compute, storage and networking infrastructure that houses their valuable IP whilst securely making applications and data accessible to its highly paid engineers and designers whenever and wherever they need it. 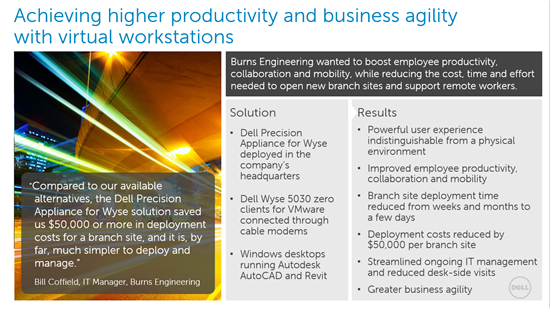 Customers in a variety of industries have embraced virtual workstations and the Dell Precision Appliance for Wyse as a way to drive enhanced mobility, security and agility. A recent customer success story is Burns Engineering, a leading engineering and construction management firm headquartered in Philadelphia, PA. I share below some of the key aspects of the company’s implementation and its associated benefits. For additional details, please view the case study on Dell.com. Building on the customer successes to-date and market momentum, Dell is pleased to announce an expansion in the Dell Precision Appliance for Wyse product family. The expanded offering now leverages Dell’s flagship PowerEdge R730 server coupled with NVIDIA’s high powered Tesla M60 GRID 2.0 technology and virtualization software VMware ESXi, VMware Horizon and Citrix XenDesktop. Customers now have a choice of two configurations, one based on the Dell Precision Rack 7910 and GRID K2A, and one based on Dell PowerEdge R730 and NVIDIA Tesla M60. This expanded portfolio offers customers a number of enhanced benefits, such as higher user density (up to 32 users per appliance), greater choice with respect to compute platform and desktop virtualization broker, and support for the latest generation secure thin and zero Dell Wyse clients, such as the Wyse 7040 thin client and Wyse 5212 AIO. For additional details on the Dell Precision Appliance for Wyse, be sure to check out the product website or have a quick read of the product datasheet.